Tuesday, March 15, 2011 at 1:36 p.m. The Legislative Apportionment Commission has decided on a Democratic map. The 11th member, Alan Rosenthal, made it all but official at his first public appearance with the commission last week. OK, I’m being a tad flippant. Dr. Rosenthal only laid out his standards for judging which map he would settle on. The list of priorities he announced publicly was less detailed than the confidential memo he reportedly distributed to the other commission members. However, if he sticks to the general principles in his public remarks, I do not see any conceivable way that the new legislative map can have fewer than 22 safe Democratic districts. Here’s why. Rosenthal’s standards allow for very little change to the current map. The first standard is his definition of equal population, which he sets out as no more than a 5% deviation. That means that all district populations should be between 214,300 and 225,300. The 2001 map had an approximate 7.5% deviation. The competitive map I drew last week had a 7.7% maximum range. Setting the maximum range at 5% severely limits the possibility of drawing more competitive districts. To do this, you would need to peel off some border towns from Republican districts – thus making them smaller than the ideal – and add them to Democratic towns to make the district competitive – and thus larger than the ideal. Rosenthal’s next three priorities are adhering to the New Jersey Constitution’s provision on municipal splits (although he said nothing about the identical provision regarding counties), contiguity, and compactness – which, barring using an actual mathematical formula, is simply in the eye of the beholder. The fifth priority on Rosenthal’s list is maintaining communities of interest. This is an acknowledged, but rather amorphous, concept in redistricting. Communities of interest can be defined in myriad ways, including people who have gotten used to voting in the same district. Rosenthal did not detail what he means by this term. This brings us to the money card in Rosenthal’s standards – continuity of representation. Rosenthal defines this as incumbents facing a familiar electorate. In other words, incumbents should be drawn into districts where the majority of voters are already represented by them. You could also call this the de minimis rule – any change should not be consequential to the current system as a whole. Anyone who has worked with Dr. Rosenthal or read his published works on state legislatures will not be surprised by how much he values this type of continuity. Lower on Rosenthal’s priority list is competitiveness, which he defines rather weakly as “absolutely no reduction” in the number of currently competitive districts and “perhaps increase [them] a bit.” Considering that most political observers can’t identify more than one competitive district in the current map, this standard is meaningless as stated. Those who value continuity see competitiveness as akin to volatility. It doesn’t have to be that way. The competitive map I proposed would likely lead to a stable Democratic majority. The only difference is that Democrats would have earn that majority in each election. Rounding out Rosenthal’s standards are minority opportunity and partisan fairness. The fact that these two factors are at the bottom of the list indicates that Rosenthal has roundly rejected the Republicans’ two main arguments behind their redistricting map. The minority opportunity argument would require revisiting the 2001 process, which dispersed minority groups across more districts. 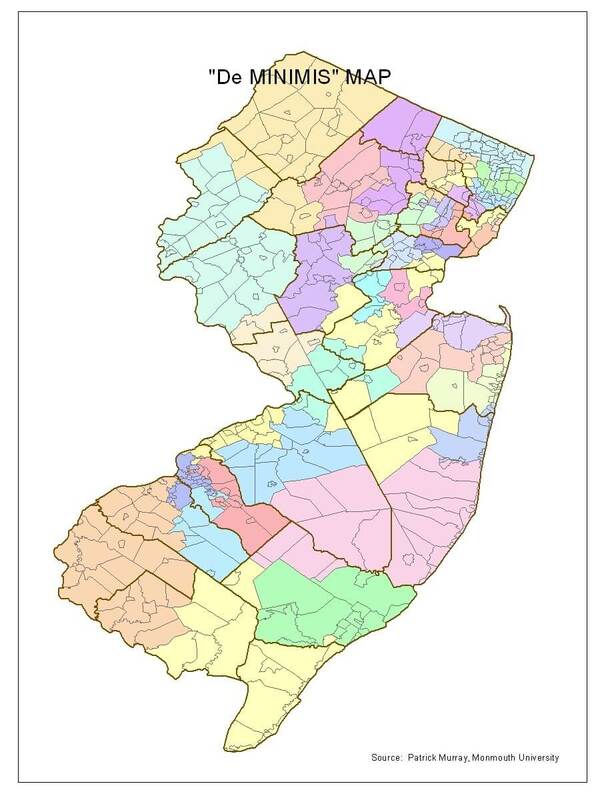 Recent court rulings on this issue indicate New Jersey is not required to create new minority majority districts, and so Rosenthal is probably on firm legal ground. In fact, I would presume that any 11th member would have been unlikely to support such a “corrective” measure. The Republican’s other point of contention – partisan fairness – is also rather weak. They argue that the partisan composition of the legislature should reflect the statewide partisan voting pattern of any single election. This assumption is patently inconsistent with our form of government. It may make sense if we lived in a parliamentary system where legislative elections determined who the governor is. But we don’t. Furthermore, our districts are drawn based on equal population, not equal participation. As such, district by district turnout can vary by as much as 50,000 voters in any given election. It just so happens that Republicans tend to represent higher turnout districts and so garner more votes statewide. Now, I actually attempted to draw a map using Rosenthal’s stated priorities. I did this with an eye toward maximizing Republican gains given the limitations of these standards. I was able to create 39 districts that ranged from 214,293 to 225,452 residents – just a couple hundred outside the range of Rosenthal’s 5% equal population definition. The remaining district has just over 227,000 residents. The map also maintains the same basic distribution of African-American, Latino and Asian residents as in the current map. The real key to the map is its emphasis on continuity of representation. As such, only 107 out of 566 municipalities shifted into different districts. That also meant that only 23 of 120 incumbents would have to challenge other incumbents for available slots. In line with maximizing Republican gains in this exercise, individual Democratic legislators would lose out. Six of them would end up facing six Republicans in safe GOP districts. Five Democrats would have no incumbent opponents, but would find themselves in decidedly less friendly districts. Another 11 Democrats would have to compete against each other for seven available seats in Democratic districts. So, a grand total of 10 to 15 Democratic incumbents would be on the hot seat. The remaining 105 incumbent legislators would be completely safe! This also means that the best the GOP can probably do is to come up with a map that creates 22 safe Democratic districts and 18 safe Republican districts (with an argument that one or two of these districts could be competitive). Perhaps just as importantly, all 120 legislators elected in 2011 will have a de facto 10 year term (barring death or scandal, of course)! So the map that emerges from these stated standards is de minimus indeed. From the start of the process, the Republicans tried to sell the line that they were prepared for redistricting. Not exactly – the two parties just organized themselves differently. The Democrats were better prepared to negotiate with whomever became the 11th member, while the Republicans spent their resources girding for a legal battle. The fact they even put Alan Rosenthal on their list of potential nominees, knowing his long held preference for continuity, is a pretty good indication they were looking past the mediation process to the courts. And since Rosenthal’s standards are well-grounded in legal precedent, they’ll likely lose there as well.